Dealing with a ruddy complexion has its share of nuisances. While often inherited, ruddy skin can also be a side effect of several varying environmental factors. While blotched and seemingly irritated skin may be a permanent condition depending on the extent of rosacea, you can minimize its appearance. There are several suggestions and tips that will help make a ruddy complexion less noticeable whether it be a temporary or lifelong dilemma. Certain skin conditions can be inherited. According to the National Rosacea Society (NRS), an estimated 52 percent of people with rosacea had a relative who also dealt with areas of redness. Common symptoms include: persistent red skin, irritation, dry eyes, and bumps. 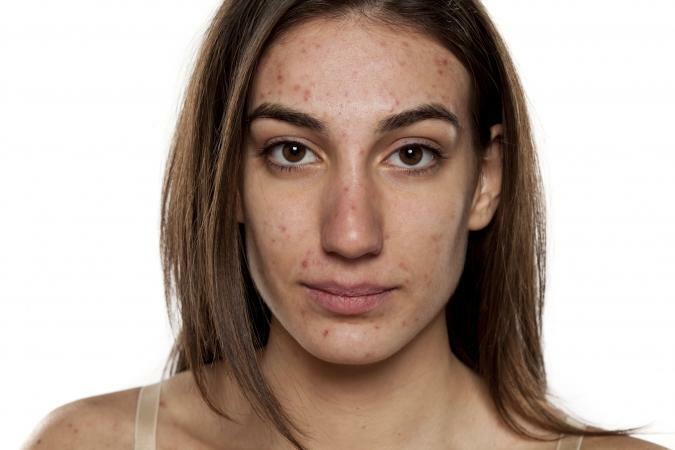 Acne is often passed down from generation to generation as well, with the number of family members who have (or had) it, increasing your risk. Symptoms of this issue are whiteheads, blackheads, red bumps, and pimples. In addition to these specific skin concerns, a study conducted by the NRS found certain nationalities were at a higher risk of having red or rosy skin. For example, people with Irish, German, English, Scottish, and Russian descent. With this in mind, it is very possible for a ruddy complexion to be inherited. Speak to your family members to determine whether this may be the root of the problem. While genetics can have a lot to do with your skin, there are other causes to consider as well, like the sun. People who work outside or spend a lot of time outdoors may experience red and splotchy skin. This is not a burn though it can look similar. The major difference between sun damage and rosacea is that it is the latter if the skin has redness with or without a sunburn. Redness and rosacea can also be triggered by overexposure to UV rays. Prevention also found that harsh weather conditions, such as chilly temperatures, strong winds, and direct sunlight can temporarily cause - or exaggerate - a ruddy complexion. Proper protection, like sunscreen and weather-appropriate clothing, will minimize the effects. Though some people deal with redness for a long period of time, others experience it only temporarily. In these cases, it is often due to changes in your skin care routine. Perhaps you tried a new line of products, have not been washing your face as frequently (or more often than usual), or tried an abrasive treatment - either at home or the spa. According to an article on unwanted reactions to skin care products on skin care specialist Paula Begoun's website, red patches and swelling may occur if there is a poorly formulated product, an allergy to a specific ingredient, if you use a harsh scrub, have sensitive skin, or the item does not work with your skin type (oily, dry, combination, and so on). This could last for a few days, weeks, or longer, depending on how irritated the skin becomes. The symptoms are likely to go away over time, however; it is best to determine the cause of the irritation and alter your routine accordingly. Another factor that has been linked to redness of the face is stress. This can be extremely damaging, affecting both your body and behavior. Common signs of stress include headache, chest pain, restlessness, irritability, depression, and skin disorders. 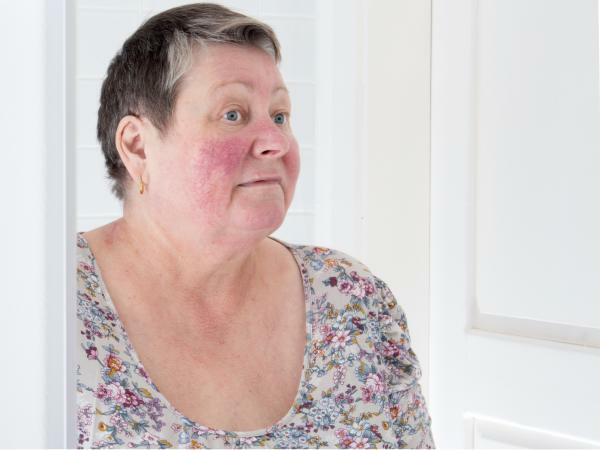 According to a WebMD article on the effects of stress on the skin, stressful conditions can make symptoms of rosacea (as well as other conditions) worse - and trigger rashes and hives. A study published in the Journal of the American Academy of Dermatology also found that the consumption of alcohol can actually increase a woman's risk of developing rosacea. This is problematic as people tend to consume alcohol more frequently when they are under stress. This causes temporary red coloring on the face, giving you a flushed look, and making a ruddy complexion more noticeable. Always start with products designed for your specific concerns. For instance, if redness is the result of an allergy or reaction to an ingredient, eliminate whatever caused the outbreak. For those experiencing irritated or painful red skin, opt for items made with sensitivities in mind. Not sure where to begin? Marie Claire suggests looking for natural products that are free from harsh synthetic ingredients. People with rosacea or an inherited ruddy complexion will first and foremost need to speak to a dermatologist. A professional can pinpoint the cause - and prescribe medications, creams, or cleansers suited to your needs. If rosacea is on the severe side, he or she might also suggest Intense Pulsed Light (IPL) treatment to even out tone. Washing your face twice a day. Though you may not want to touch the skin too much, Doctor's Health Press says this step is important, as dirt and oil can lead to inflammation. Use fragrance-free cleansers whenever possible, like the Aveeno Ultra-Calming Foaming Cleanser for Sensitive Skin (about $6). Reach for gentle moisturizers and lotions. Anything with cucumber or aloe (like the Aloe Vera Soothing Day Cream, around $20, from The Body Shop) will soothe the face and reduce the appearance of redness. For more ways to tone down a red face, check out the eHow video below on evening out a ruddy complexion. What you eat can also make a noticeable difference in the way your skin looks. To combat facial redness, you should be eating plenty of fruits, vegetables, and foods with omega-3 fatty acids. They reduce inflammation and help your body stay hydrated - improving the overall appearance of your skin. It is just as important to steer clear of foods that can cause a flare up of redness, like spices and peppers, as well as foods that cause inflammation, like deli meats, peanut oil, or canola oil. Additionally, limit your intake of processed foods, dairy products, and anything with MSG. These can lead to inflamed blood vessels which make your skin appear flushed and discolored. In addition to treating a ruddy complexion, makeup can temporarily cover up uneven areas. One of the most effective items to incorporate into your daily routine is a green color corrector. Red and green are opposite one another, which is why it works so well on rosacea and ruddy-looking skin. Hard Candy Color Correct Radiant Primer: This color-correcting primer helps neutralize redness while prepping skin for makeup application. It's about $5. Maybelline Master Camo Color Correcting Pen: Available for about $10, this concealing product is quick and easy to use. It offers precise color-correcting coverage and is easy to blend. Urban Decay Naked Skin Color Correcting Fluid: This versatile product can be used alone to treat specific areas, or mixed with primer to treat all-over redness. Find it for about $30. Lancome Teint Idole Ultra Wear Camoflauge Color Corrector: Also about $30, this corrector provides full-coverage and long-wearing color neutralization. After this step has been completed, you can move onto the rest of your makeup routine. Using a mineral foundation is a good choice as these products often have natural ingredients that are less likely to cause irritation. Also try blushes in peach or bronze shades and lipsticks without red undertones, like mauve or brown. Small alterations to your day-to-day life can dramatically affect the way your skin looks. If you want a more even complexion, reduced redness, and less inflammation, then it may be time to change your lifestyle. Since stress is often linked to a flushed or rosy complexion, it is vital that you find ways to deal with it in a healthy way. Some suggestions include: doing something you love, going for a walk outside, getting enough sleep at night, and practicing relaxation techniques, like calm breathing and meditation. Exercise is also effective. The Mayo Clinic found that working out is a great stress reliever as it boosts endorphins and improves your mood. However, some exercises can actually cause blood vessels to dilate, making the signs of rosacea more obvious. To prevent this, go for a swim instead of running on a treadmill, or work out in a room that is cool and comfortable. If you have a ruddy complexion, you are certainly not alone. Millions of people around the world are currently dealing with this issue. Whether these areas of redness are due to genetics or outside factors, it is possible to minimize their appearance. Through lifestyle changes and the use of effective products, you can achieve even coloring.